Five cities in the North of England are to unveil a £15bn plan to improve road and rail connections in the region. The joint One North report will include plans for a new 125mph inter-city rail link, faster links with Newcastle and better access to ports and airports. It has been developed by an alliance of five cities - Leeds, Liverpool, Manchester, Newcastle and Sheffield. 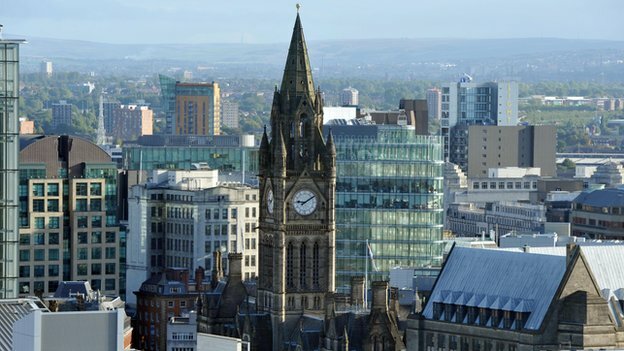 It comes after George Osborne said faster links between Manchester and Leeds could create a "powerhouse". The report will be presented to the chancellor in Manchester later. In a speech in June the chancellor said the cities in the north of England were individually strong but were "collectively not strong enough". He said better road and rail links would allow cities across northern England - from Liverpool to Hull - to create a "northern global powerhouse" and "take on the world", as London had done. 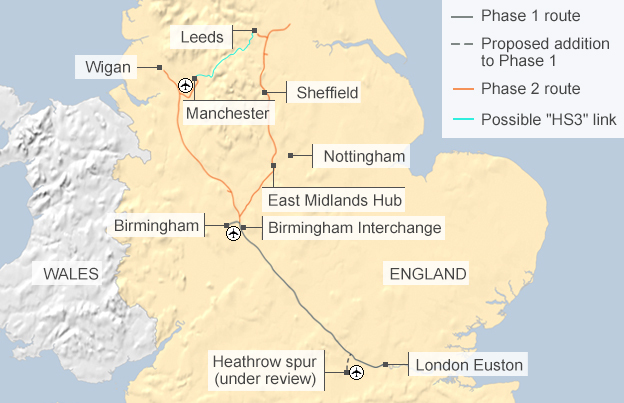 The chancellor said the plan for a high-speed rail link between Manchester and Leeds could cost up to £7bn - but could be cheaper if existing rail lines were updated. He said a so-called HS3 should be considered as part of a review into the second phase of the HS2 high-speed rail project. The current plan for the first phase of the project between London and Birmingham has proved controversial. Many people living along the planned route have raised objections, and there is criticism of the £42.6bn estimated total cost. The government's preferred route for the second phase involves extensions linking Birmingham with Manchester and Leeds - with the final route expected to be chosen by the end of this year. Mr Osborne said HS3 could cut the journey time between Leeds and Manchester from about 50 minutes to 30 minutes, with trains travelling at up to 140mph, compared with the current maximum of 90mph. BBC's northern business reporter Sarah Corker said the One North report would describe how faster links from east to west in northern England could provide a huge boost to the economy and create jobs. She said it was an "ambitious transport plan with the aim of transforming road and rail connections between the northern cities and unlocking the area's economic potential". Our correspondent said council leaders in northern cities had argued that for years transport links in the region have been far too slow and inferior compared to those in the south of England.